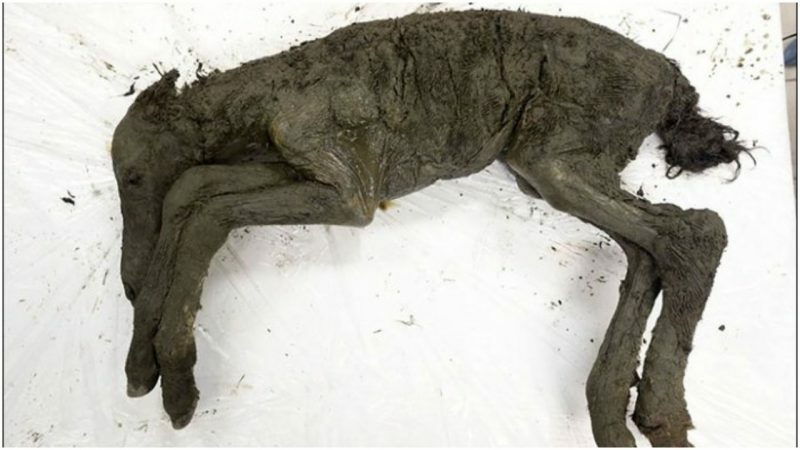 The perfectly preserved remains of a 40,000-year-old foal were discovered by a Japanese-Russian team of scientists who were searching the melting permafrost of Siberia for evidence of the lives of ancient woolly mammoths. 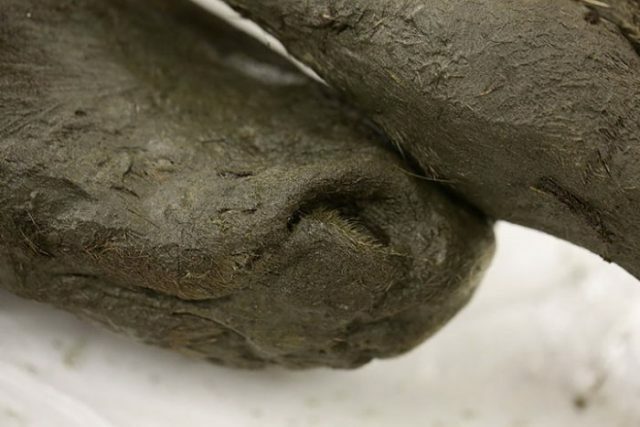 The mummified foal, about 37 inches tall, was so well-preserved by icy conditions that the skin, the tail, the hooves, and even the hairs in the animal’s nostrils and around its hooves are still visible. 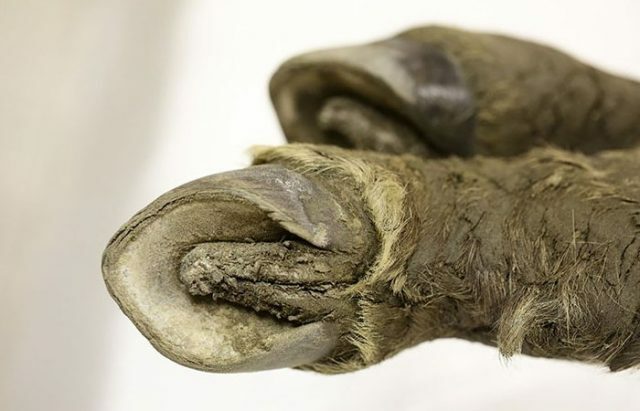 “The foal has no damage to its carcass, even its hair is preserved, which is incredibly rare for such ancient finds,” said Semyon Grigoryev, head of the Mammoth Museum in Yakutsk, at a media conference held on August 24, 2018, in Yakutsk, called the coldest city in the world. In this Eastern Siberian city, the average high in January plunges to minus 40. The modern-day Yakut horse is the hardiest in the world, capable of surviving temperatures of minus 40. Deputy Head of the North-Eastern Federal University, Grigory Savvinov, told the Siberian Times that the best theory is the foal fell into a natural trap and drowned. The fossilized specimen was only two or three months old when it perished back in the Upper Paleolithic, or Late Stone Age. “We’ll study content of its bowel to understand the foal’s diet,” says Grigoryev. It was found during an expedition to the Verkhoyansky district of Yakutia and was dug from its grave some 100 feet beneath the original surface of the depression. The discovery was made by a team working inside the Batagai depression, a huge thermokarst crater nicknamed “the Mouth of Hell.” Locals in the Yakutia region see this crater as superstitious, and regard it as the gateway to the underworld. The gash in the tundra was reportedly caused by clearing of forests during the Soviet era. This allowed the ground to warm during the summer months enough to trigger thawing of the permafrost. The crater it is now being enlarged and shaped by climate change, according to local scientists. It is of particular interest to paleontologists who estimate that 200,000 years of climatic history could be revealed, according to a study titled ‘Preliminary paleoenvironmental analysis of permafrost deposits at Batagaika megaslump, Yana Uplands, northeast Siberia’ published in Quaternary Research in March 2017. The rapid rate of growth of the Batagai depression and other similar craters is seen as a cause for concern by climate scientists. “Chunks of thawing permafrost fall off the cliffs, up to 330 feet high, causing a booming sound which adds to the fears of nomadic groups in this icy outpost,” reports The Express. Sergey Fyodorov, a researcher at the Institute of Applied Ecology, Yakutsk, said: “One of the most serious things we must understand looking at this slump is that its growth is not something we, humans, can stop.” One of the main worrying consequences of thawing permafrost is the release of methane, a potent greenhouse gas, into the atmosphere. He said it was fortunate this happened in a remote area away from a more populated settlement.